When it comes to budget family travel, camping is always a popular and fun way for families to vacation on the cheap. Our family loves car camping, but roadtrip camping has always been daunting, until we encountered the Jucy campervan. The distinctive green and purple Jucy Campervan sleeps 4, but it seats 5 (if you have 3 smallish people who can squeeze in the back comfortably). Our family of 5 includes a 2.5 year old still in a full-size car seat. 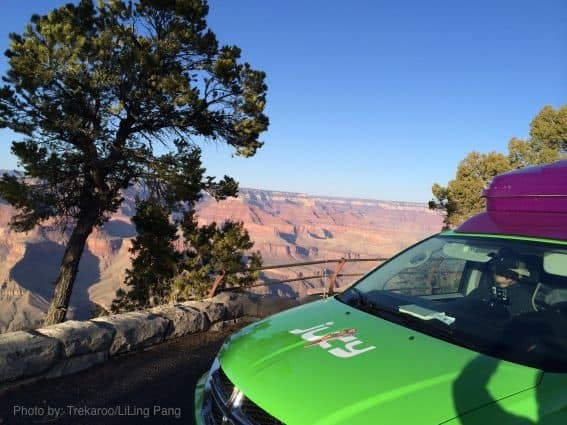 We were curious to push the limits of the Jucy campervan, so we took it on a 9-day winter time road trip covering 4,500 miles from San Francisco, California to Albuquerque, New Mexico. Check out our Route 66 roadtrip highlights video below and get the scoop on what it was like to live in a Jucy Camper for 9 days. The Jucy Campervan is efficient living at its best. These cleverly designed campers are a throw back to the smart designs of the iconic Volkswagen Westfalia’s of yesteryear. The van comes with a stove, refrigerator, pots and pans, dishes, and cooking utensils. 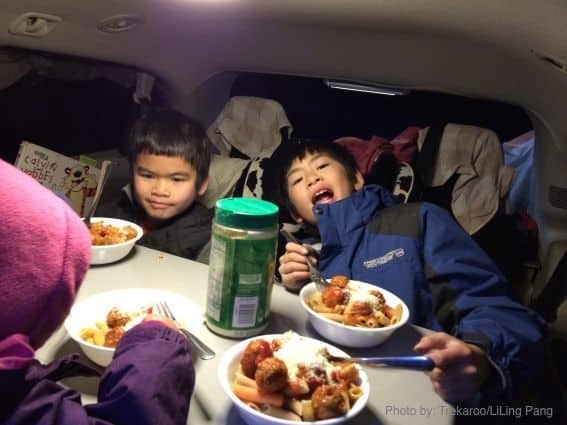 The Jucy even comes with a kitchen sink and dining table, all contained within a minivan. A Dodge Grand Caravan to be precise. The advantage of it’s compact size is that the fuel mileage is the same as any minivan (we got about 21 miles to the gallon on freeways), and the cost of renting one is nothing like a regular RV. Depending on the time of year, you can rent a Jucy from $33-100/day. 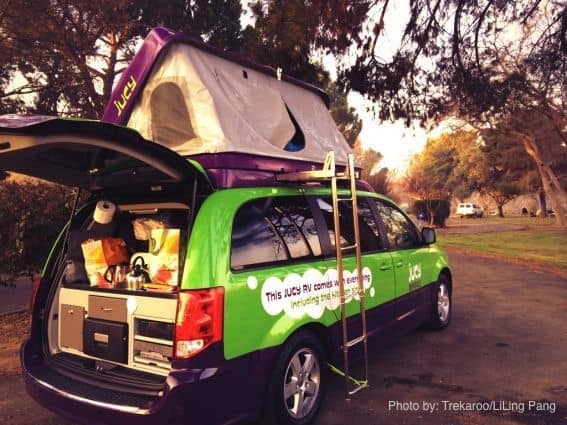 If you are planning to rent a car anyway, the Jucy Camper gives you wheels and a place to rest your head at night. 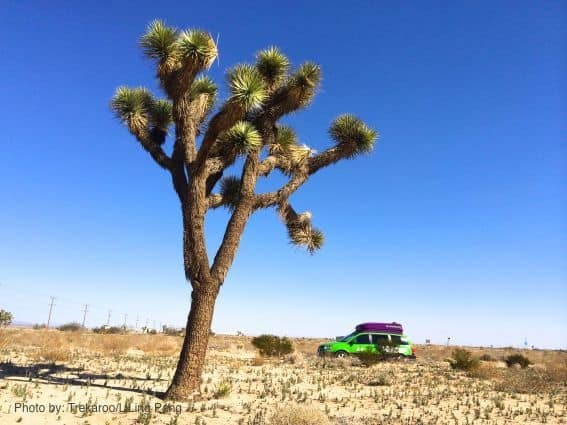 If you’re a first time camper without camping equipment or if you’re flying into Los Angeles, San Francisco, or Las Vegas, you can essentially rent a Jucy camper and not have to bring along any extra camping equipment. Personal kits can be rented as well. These include a pillow, a warm blanket, and a towel. The Jucy camper surprisingly comes with 2 stoves – one that is attached to the vehicle and the other is portable so you can cook on a picnic table. A very nice added amenity that we used a lot for cooking and cleaning was the small foldable table that stows away neatly under the penthouse roof box. The mini kitchen includes a refrigerator that runs on a second battery and keeps cool for over 8 hours without the car running. It’s not quite as big as an ice-chest, but you also don’t need space for ice. We were able to keep 3 days worth of meals very cold. No wet and messy ice-chest to deal with. The custom kitchen includes a spot for everything, making it accessible without unpacking the whole car. This was great for roadside picnicking and quick camp set up. -The stoves cook slowly, especially in windy conditions. Creating wind blocks helped, but were cumbersome. Four is comfy. What about five? The Jucy camper worked great for 5 people except during bedtime when it could really only accommodate 4 people comfortably. Anyone over 5’7” would need to sleep in the penthouse roof box, as the cabin’s double bed is rather short. To accommodate the fifth person, we tried a few different options. The best solution was setting up a 2-man tent for the fifth person. However, it added time to the set up and break down time each day. We also tried setting up a sleeping space for our 2-year-old in the front passenger seat by putting a pillow in the middle console. This proved challenging as the outside and dashboard lights were too distracting. We also tried squeezing her in the double bed between mom and dad inside the van. While she slept better, mom and dad did not. One possible option for 3 small children would be to sleep them sideways in the penthouse roof box. Setting up camp was a breeze. There were nights when we drove till about 11pm before stopping to camp. It took just 15 minues to get everyone in their beds for the night. Packing up was always longer, but still much faster than if we were tent camping. This made the idea of a camping road trip with a stop at a different campground each night actually feasible with 3 kids. One night in the Grand Canyon, the temperature dropped to 16 degrees. The Jucy Camper gave us a place to escape the cold. It was so windy, we huddled inside the van around the dining table and stayed warm. That night, all of us who slept in the camper were cold, but at least we were protected from the wind. Not so for poor dad who decided to sleep in the tent that night. The Jucy camper certainly makes it possible to extend the camping season for families with young kids. Jucy is pretty new in the US so there are only 3 pick up locations – Los Angeles, San Francisco, and Las Vegas. The San Francisco location actually is very far from the San Francisco airport. It’s about a 40 min drive or a $150 cab ride away. It is closer to the Oakland Airport but there is no shuttle, making it costly to get to without a car. Also, the 100-miles free per day is limiting. Every mile after that costs 25 cents. The cost of additional miles can really add up in California and Nevada where the driving distances are far. For a limited time, Jucy Rentals is offering Trekaroo families an exclusive 15% discount on any rental through December 31, 2014. Use the discount code: Travel14 at check out..
Disclosure: Jucy provided a complimentary rental for me to take their campervan for a spin. However, as usual, these opinions are entirely my own.